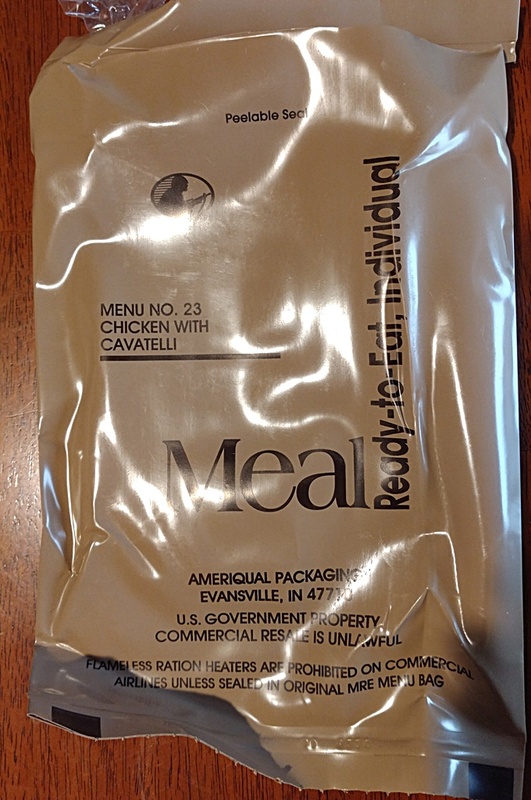 Continuing to "eat through" my 2006 Case B of MREs, last week I sampled Menu 23 Chicken with Cavatelli. The Tropical Punch was not as sweet as I expected. Very artificial and slightly "chemical" tasting. Not a great drink. The Cheese spread was very salty and the Bacon flavor was pretty strong. At first I liked it, but after a few bites, it was really too much. And as I noticed the the 2 previous meals from this case, the Cheese was past its prime--grainy and a little dark. The Wheat Snack bread was still good...well, as good as it ever was. Dense and a little dry, but OK.
Again as seen in previous meals from this case, the peanuts have begun to turn. They are bitter and tangy. 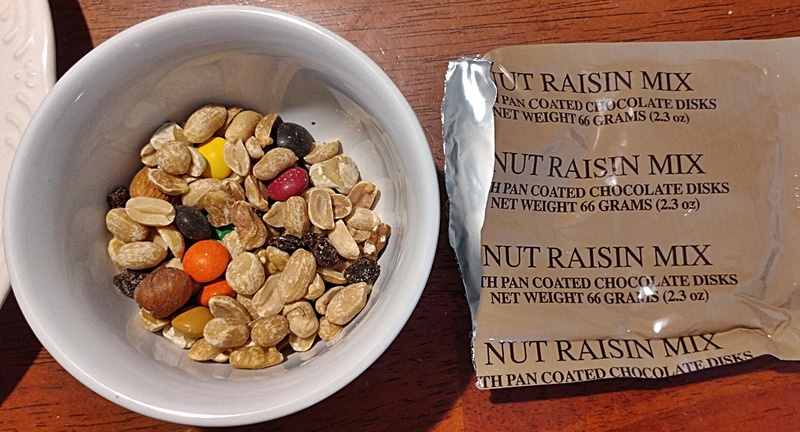 This mix was mostly peanuts with a fairly small number of raisins and some "chocolate disk candy" (generic M&Ms) and only a couple of other nuts. 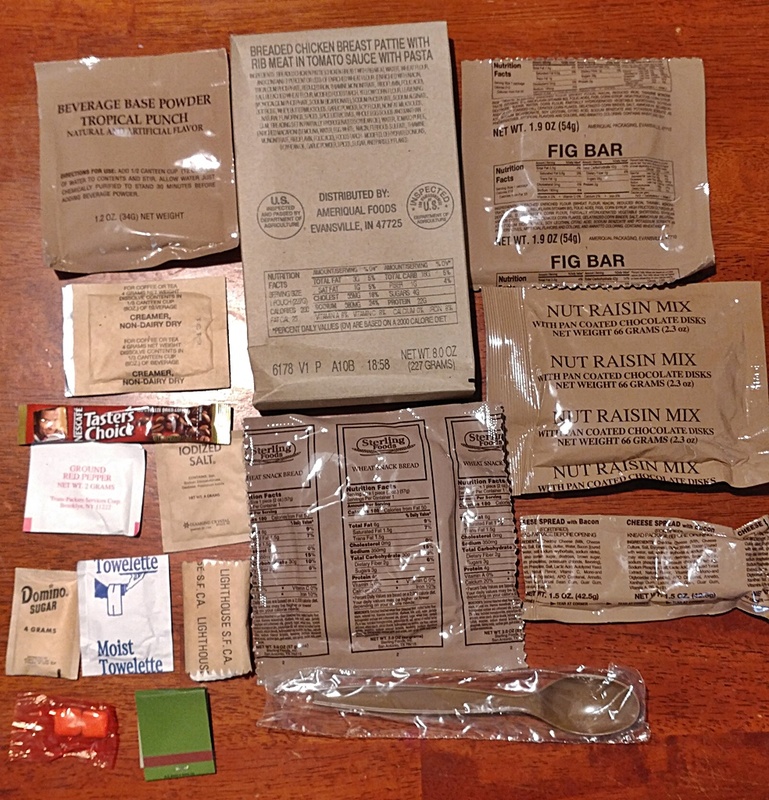 I picked out the other nuts and the chocolate, but they all seemed to have taken on some of the taint from the peanuts. Most of this was left uneaten, EVEN THE CHOCOLATES! You can see that the pasta is small shells (Cavatelli) and they were pretty much caked onto the Pattie (odd spelling, but that's what the box says). 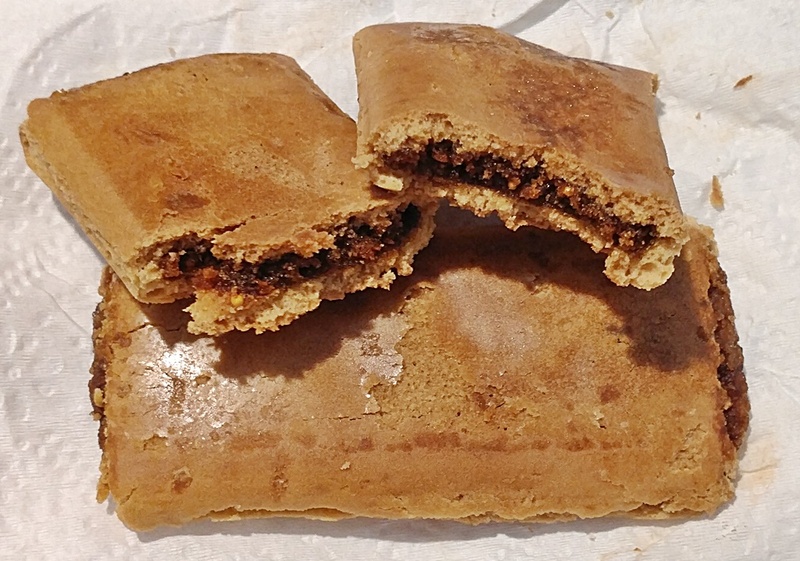 The Pattie is also listed as "Breaded", which could be seen, but the wet Tomato Sauce pretty much made it a glop. In spite of that, the taste was actually pretty good! Some of the pasta shells were kinda dark colored, but maybe they were always like that? It tasted good by itself, but after sprinkling on some of the Ground Red Pepper, it was even better! The inclusion of Ground Red Pepper was a surprise to me...I have previously seen hot sauce in liquid form. Yup, I ate it all. The Fig Bars were like two slightly longer Newtons. I like Fig Newtons, but a few bites were all I needed of these guys. The flavor was actually OK, though. But VERY dry, very dark and very hard on the ends. As this was lunch for me, I saved the coffee for the next morning. I was still in good shape, as was the creamer. A fair cup of instant coffee with no surprises. There you have it. 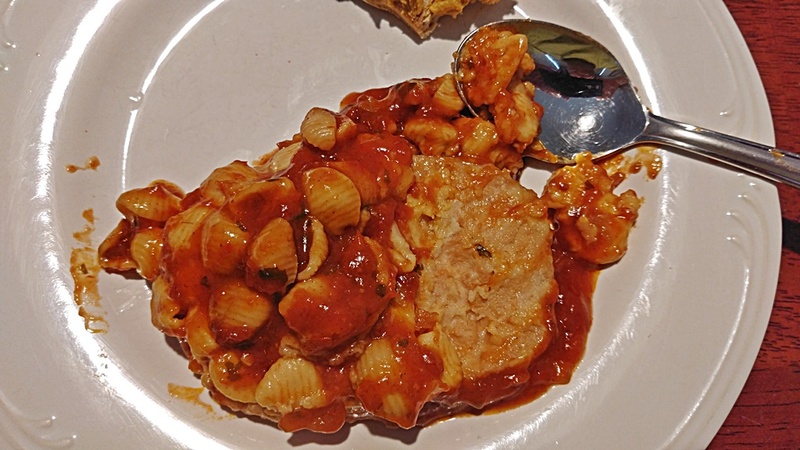 Overall, this was less enjoyable than the previous 2 from the case (Meatloaf with Gravy and Spaghetti with Meat), mainly because 2 of the sides were not in good shape. Please let me know if you have any questions. Also please do reply if you want me to keep reporting on this case...I haven't really gotten much feedback from the last two, so maybe these aren't very interesting to you guys. Thanks!